AMAX Interactive proudly presents the next adventure in their best-selling series Puppet Show! Your cousin sends you a dire letter, begging you for your help. Angela was just hitting the prime of her career, starring as Ophelia in Hamlet, but she's been cursed by a doll and now she lies on her deathbed. Can you uncover the true culprit, or will her first performance also be her swan song? 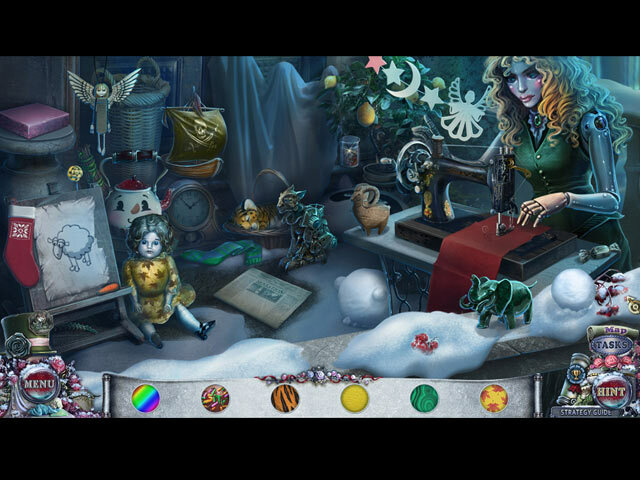 Find out in this twisted hidden-object puzzle adventure game! Solve another mystery in the bonus chapter! Collect hidden flowers to display in your garden! Locate snowflakes hidden throughout the game. Replay your favorite Hidden-Object Puzzles and mini-games. Enjoy exclusive wallpaper, screensavers, music, and more! 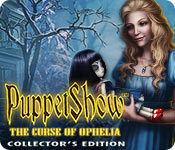 PuppetShow: The Curse of Ophelia Collector's Edition is rated 3.6 out of 5 by 23. Rated 5 out of 5 by biscuitsmama from MAYBE THERE ARE SOME ROLES YOU SHOULD SIMPLY REFUSE TO PLAY It is hard to believe that Puppet Show the Curse of Ophelia is game number 13 in the Puppet Show series. Before trying the demo I was actually ready to hate the game simply because I am so done with the series in general. After all, aside from the first original storyline games the others have been duds. I’ve been surprised that the series didn’t fold long ago but we all know that BFG is infatuated with serial games and does seem quite reluctant to move in new directions. At any rate aside from the high-pitched squeaky voices of our leading ladies, the game is much better than I anticipated and I will definitely be buying this one. Not only did I enjoy the demo, I was left wanting more when it ended – a very good sign that I will enjoy the full game. I’m not going to spend much time going into the storyline because you will hear that from others but I will only say that you again play a detective and you are off again to help a friend in need. In this case your friend has become ill since her starring role in the theater production of Ophelia. It is said that there is a curse on the role and that seems like it might be true. Will you be able to help Leroy save his wife before the curse claims her? The graphics in the game are pure AMAX/ERS with gorgeous artwork graphics. Now, if only the voices were as wonderful as the graphics it would be awesome. However, listening to Angela and Beatrice is like the proverbial fingernails on the chalkboard – simply grating! The HOPS and puzzles hold no surprises but I still happen to enjoy the HOPS from the AMAX team. The puzzles are not difficult and I seemed to breeze through them quite easily. We all know to expect at least one or two hair-pulling mini-games after the demo so I am sure that I might get stuck later and need to resort to the SG. The CE version of the game is quite an improvement from what we normally find in CE games from this development team. There are two types of collectibles to find but I like the flowers the most since we will learn more about them later in the extras section. We have achievements to earn and most of the other standard extra fluff but I am really impressed that AMAX has finally included the option to replay the HOPS and Mini-games that, IMHO, increase the value of any CE game. There are 11 Mini-games and 19 HOPS to replay in the extras section. It looks like there are almost twice as many HOPS as Mini-games so those of you who don’t care that much for puzzles should be happy. Other extras include 7 Wallpapers, 16 Concept Art, 5 Screensavers, and 4 Music Tracks. As always you will find the Bonus Chapter and the in-game Strategy Guide. Since becoming a member at BFG it is fair to say that I have played a ton of HOPA games. I’ve used the term cookie-cutter quite frequently because the games all seem to follow a set pattern. But to be honest even though I use that term frequently, it doesn’t mean that I still can’t find something to enjoy about most HOPA games. I am a hopeless HOPA game addict and playing them is my favorite form of entertainment no matter how many lost zipper pulls I must find or wires I need to tape together. Even though I know I will enjoy this game, please try the demo to see if Puppet Show Curse of Ophelia is one you will enjoy as well. Happy gaming! Rated 4 out of 5 by Tomsde from Another Twist on PuppetShow I've played ALL the games in this series. I enjoyed this one and I like being able to pick an avatar to represent my character--I wish more of this genre would do this. The story was at once different and familiar. I'm glad they've gotten rid of the curse Egyptian magic doll wand thing. If you like the series you'll be sure to enjoy this one; the steampunk retro look that's a hallmark of the series is definitely still there. Although I wouldn't say it was my favorite, I liked it enough to recommend it to fans of the series--and I personally did not miss the "spider" puppet. As usual I had trouble finding all the collectibles and wish they would give us a way to jump back to the scenes where we missed them and find them. Rated 4 out of 5 by rainworm from The never ending show has its 13th performance Before we even start, we get a warning ‘game contains puppets and dolls of all kinds’ – would have expected puppets in a puppet show…. But there are some real people as well: we play as cousin to Angela, an actress at Katzenberg theatre and about to play the leading role as Ophelia. She was about to do so, when she was attacked and since then lies in a coma. Leroy, had asked for our coming. Something supernatural is about Angela’s state, she is covered with symbols and remains unconsious. There are rumors about the Ophelia role. All, who play it, are cursed. They get a doll before their first performance, the symbol of the curse, which in the end kills the actress. Leroy and we hurry to the theatre to find out more about the masked man, who attacked Angela and about the doll, which must have something to do with the strange events. Nobody really believes in black magic or a curse, a very real culprit must be behind all this. And real enough: In a shed we find the masked man, have a fight and he turns out as the girl, who thinks of herself as the one, who should play the Ophelia…… As usual, artwork is stunning and we have lots of puzzles and HO s. Pace is quite good. The doll, symbol of the curse, mutates to a helper, who brings items, which are out of reach. So is it all about a girl, who is jealous of a colleague getting the star role, which she thinks she is born for? But the town of Katzenberg seems to have a dark history, so it is quite possible, there are more secrets to discover. Rated 3 out of 5 by Granny_Gruff from Worst, Worse, and Not So Bad! You were wanting to visit your cousin Angela anyway, but when an urgent letter arrives from her husband Leroy, you hurry to her home. Leroy wrote that she was dying of a curse and you hope to be of some help. Good stuff: There are all the elements you expect from a PuppetShow game - people in bad masks, a theater, and some semblance of a story. There are also lots of dolls in this chapter in the series. There are HOPs, mini-games, puzzles, and CE bling, including two collectibles: morphing snowflakes, and flowers. Bad stuff: The story leaves much to be desired in the way of logic. You arrive at Angela's home in time to see a masked figure threatening her through the front door. As you run around the front yard completing tasks to get inside, heavy black smoke seems to be escaping from the doors and windows of the house. Opening that front door you are looking down a long hall to Angela's bedroom. So how did you see that masked figure? Was he just posing near the front door for your sake? Where did the smoke come from and where did it go? Leroy sent you a key to get in the house as he doesn't want to leave the comatose Angela even to answer the door, but then goes with you to the theater, leaving the house wide open! There is so little engagement with the other characters, there is no reason to care what happens. While the game is better than the latest disappointing offerings in this series, it also seems as though it should be in a different series altogether. The "cursed" doll is a windup toy rather than a puppet and the only other animated figures in the Demo were part of a door lock. The last few PuppetShow games were so bad that this one almost shines in comparison. Unfortunately that only makes it average at best. You really need to give the demo a try as you may like this PuppetShow better than I did. I cannot recommend what I will not buy. Rated 3 out of 5 by pennmom36 from THE CURSE IS COMING FOR YOU Everyone knows that ALL porcelain dolls are possessed, except for Angela and Beatrice, who were so anxious to become leading ladies, that they chose to ignore the Curse of Ophelia! Angela was cast to play the leading role of Ophelia, in the theaters latest production, a role nobody else was willing to portray, because of the superstitions surrounding Ophelia and anyone who dare assume the role. Accepting the role was Angela's first mistake, not believing in the Curse of Ophelia, was her second mistake, a deadly mistake! I must admit, I was a little confused by this latest PuppetShow game, where's all the puppets? Yes there are plenty of dolls, creepy dolls, but the is a PuppetShow game not a CreepyDollShow game?? Isn't this game supposed to be about towns that are run almost entirely by puppets? Isn't that creepy SpiderPuppet supposed to be spying on my investigation? Well the good news is that this game is a lot better than the last several games, perhaps because they have toned down the weirdness factor. In my opinion, however, they should have just started a completely different series, such as a spinnoff about dolls, without any puppet references. I was also more impressed with the CE bling offerings, which were almost void in the last few PuppetShow games. There are Collectible Flowers in each scene as well as a very well hidden Morphing Snowflake, that is supposedly in every scene as well, but there wasn't one available within the dressing room location, even the SG doesn't show it's existence there???? The Hidden Object Scenes were much better than offered in the last few games, but there are no Alternative games available. Most of the main HOP's are Interactive List finds, but there are also Keywords in Sentence finds and Silhouetted Shape finds. There are actually more Zoom Zone HOP's than regular ones, that require finding a handful of Silhouetted Shapes, Symbols or Fragments. The Mini Games are just okay, with nothing new offered, and fairly simple to solve. Below are brief descriptions of some of the games you'll encounter during the demo: 1) Select two pie shaped puzzle sections to swap to complete the picture. 2) Swap Mask halves correctly, then place gears of different sizes until all gears are turning. 3) Play the bells in the correct order according to the clue shown. 4) Use the reference clues to select the correct flowers. 5) Complete the picture by sliding tiles to allow the key to slide out. 6) Select the dolls in the correct order as described in the clue. 7) Use directional arrow buttons to guide your horse without hitting obstacles along the path. PUPPET SHOW GAMES AVAILABLE Title***Collector's Edition Release Date***Average Rating 1-Mystery of Joyville SE only (October 2-2009) 4.0 2-Souls of the Innocent (May 28-2010) 4.3 3-Lost Town (March 10-2011) 4.1 4-Return to Joyville (April 19-2012) 4.3 5-Destiny Undone (March 28-2013) 4.2 6-Lightning Strikes (August 21-2014) 3.3 7-The Price of Immortality (March 19-2015) 4.4 8-The Face of Humanity (January 21-2016) 3.7 9-Her Cruel Collection's (September 15-2016) 3.3 10-Bloody Rosie (November 17-2016) 3.6 11-Arrogance Effect (July 22-2017) 2.8 12- 12-Poetic Justice (October 5-2017) 3.3 13-The Curse of Ophelia (February 3-2018) n/a by: Amax Interactive Other Amax Interactive games: Redemption Cemetery/Spirits of Mystery/Dark Tales/Grim Facade/Haunted Legends/Shadow Wolf Mysteries/Queen's Tales/Twilight Phenomena/Reveries/Christmas Eve/Maestro/Ghosts of the Past/Forgotten Books/Beyond the Unknown/Haunted Halls/Flights of Fancy/Azada/Reality Show/Phantasmat (Crucible Peak only)/Gothic Fiction/Dark Alley's/Hidden Wonders of the Depths/Pathfinders/Sarah Maribu/Steve the Sheriff/Many Years Ago/Mysterious Travel This Collector's Edition version has 7 Wallpapers, 16 Concept Art pictures, 5 Screensavers, 4 Music Soundtracks, 21 Movie Videos (WOW, seems like this is just filler so they don't have to offer actual game play features) 11 re-playable Mini Games, 19 re-playable Hidden Object Scenes, 20 Achievements to earn, Collectible Flowers (with origin descriptions) Morphing Snowflakes in each location, a built in Strategy Guide and a Bonus Chapter. Rated 3 out of 5 by sunnyglow from CURSES! ANOTHER DEAL BREAKER FOR AN ACTRESS UNDER CONTRACT! OVERVIEW: Detective! Travel back in time to 1887 – to Katzenburg, to investigate a case based on a curse - the Ophelia curse! Angela, the lead actress for this role in “Hamlet,” has gone into a coma. Apparently, this “curse” has affected her as it affects all the actresses who play this part. The actress assigned to play Ophelia receives a doll and then ends up dead the next day with symbols all over her body. Snooping around a town known for its puppets, you will soon discover there is more to this case than meets the eye! Who is the puppet master behind all the drama within this game? This is another great game for those who love this series or those who like easy breezy games. It is a good game for children as well. This will be a pass for me; however, I do believe it is somewhat better constructed than most games within this series. MECHANICS: As usual for AMAX, the graphics are gorgeous with soft tones and rich colors. They are truly classic in design. Just breathtaking! The story is just another variation of the same ones we have seen in the past. The theme is always the same. Some evildoer creates or uses puppets to do his/her dirty work against a person or group of people. The pace is excellent. There are plenty of activities within the game. Many of the inventory items require assembly or some type of action performed upon them before they are operational. You have six choices for your character, choose between three female and three male characters. You can replay eleven (11) puzzles and nineteen (19) HOP scenes. You collect snowflakes and a massive number of flowers. The puzzles are extremely easy. This game does have its groupies; however, I wish AMAX would develop some new series. This ten-year old series is well past the expiration rate and has been “milked” for all its worth. HELPER: GRUMPY DOLL! There is a helper, a black-eyed, black-hearted piece of porcelain. With a scowl on her face, reluctantly she helps you retrieve items. Grumpy Cat would love this doll! At least she does not prance around nor make faces at you from the side of your inventory bar. However, she does alert you when she is to be used. I will not play games with helpers, so this is another reason I did not purchase this game. HOP SCENES: In the demo there are an even amount of HOP scenes and puzzles. I feel they are more creative than the puzzles. Most are standard lists of items and silhouette scenes. However, there is one replacement scene in which the player places items back into the scene. There are quite a few mini-HOP scenes in which the player searches for a small amount of one item. There is one scene which requires the player to locate items based on their fabric pattern or their material constituency rather than the silhouette of the object. PUZZLES: They are all easy. I did not find one which was even moderately difficult. Most of these are excellent for children. In one, lead a horse down a path while avoiding obstacles in its path. There is also an excellent tracing puzzle for children which involves outlining a design without touching the edges of the design. Others include matching mask halves, switching or rotating tiles or rings to recreate pictures, and a “punch out the evildoer” puzzle which I feel is more creatively designed than most I have seen from other developers. LEVELS: Doll, Puppet, Puppeteer, Puppet Master Hints and Skips: 5 to 200 seconds EXTRAS: Map is given to you at the beginning of the game. A doll helper used to retrieve items. 20 Achievements Collect 29 Snowflakes and a massive amount of flowers Replay 11 Puzzles and 19 HOP scenes 7 Wallpapers, 16 Concept Art, 5 Screensavers, Music, Movies HERE ARE THE DETAILS (SPOILERS) FOR THOSE WANT MORE INFORMATION ON THE HOP SCENES AND PUZZLES IN SEQUENCE HOP SCENES: (A) List of items (B) Silhouette. Locate items in groups of 3. (C) Mini-HOP scene. Silhouette. (D) Mini-HOP scene. Locate 9 rose petals. (E) Variation of a silhouette. Locate items based on fabric patterns which appear on the items to be located. (F) Mini-HOP scene. Locate 7 swirls. (G) Replacement scene. Replace items back within a scene. (H) Mini-HOP scene. Locate 5 components. PUZZLES: They are all easy – extremely easy. A. Switch puzzle. Switch tiles to create a picture on a round disk. B. Multiple step. (1) Switch puzzle. Switch mask halves to complete the masks. (2) Gear puzzle. Place gears into the proper location. C. Sequence puzzle. Ring bells in order as to a given code. D. Sliding tiles puzzle. Slide tiles so that those tiles with broken edges arrange to provide an opening to uncover a key. E. Follow the leader. Follow Leroy’s horse while avoiding obstacles in your path. F. Tracing puzzle. Trace a line through an image without touching the outside lines. G. Switch puzzle. Switch the halves of books to create the symbol in the middle of the books. H. Rotating rings puzzle. Rotate rings to recreate an image. I. Punch out the evildoer. Click on a fist quickly to change the background to green and move an arrow to green to knock out an evildoer. Rated 2 out of 5 by DBlade from Worst Puppet Show game yet This game has a stupid story line. A lot of the puzzles have no explanation and don't make any sense. How does the picture of the three dolls tell you what the combination is to that safe or room or whatever it is? Why is there no Blog Walkthrough or in-game strategy guide? The game is boring and tedious and as far as I'm concerned marks the end of the Puppet Show series. Too bad. Rated 2 out of 5 by Hemene from I Expected SO Much More... This is the first poor review I have given a Big Fish Game, but I was very disappointed in the overall quality of the game, the storyline and the unevenness of the games within the game...including a lack of instruction on several of them. I found the graphics to be dark and muddled even having turned up the brightness on my screen. The storyline was unispiring, and, while I finished both the main game and the extra game in the Collector's Edition, I did not enjoy them. To my mind, the first of these Puppet Show games was the best and the remaining ones downhill from there. I won't begrudge the credits used to purchase the game, yet do not feel it was worth the time spent on playing. I finished it, but it will definitely not be a replay for me. It might be time to retire this series. Rated 2 out of 5 by dancemom1 from Time for a retirement party! Hello friends! As usual, I review mostly on the game play and leave the story to those who do a much better job than I. We have so many of these in this series, that I've lost count! This addition is exactly the same as all the others, with nothing new or exciting. Graphics are pretty nice and clear. Colors seem a little clearer and not as much of a haze as in others in this series. Voices were okay, but sometimes annoying, depending on the character. Very little character interaction. Game play was very nice, with no problems during the demo and it fit my large screen very nicely. We rarely had any music, except when something was about to happen and no real sound FX. It was a very quiet game. Again, we have a helper who helps get into dark, small and high places. She is a creepy "cursed" doll. HOPs are okay, not much of a variety, but scenes are fairly clear and items are not difficult to find. You have to "correctly place this item," match an item to a color/texture, and interactive HOPs. I did not see that you could switch to something other than HOPs. The puzzles are extremely simple and nothing new. I especially do not care for the "follow the line" puzzles..they are boring and old. Hint system very helpful, but does it transport? The map is put together fairly well, areas are well identified with picture and it does show if you found the collectible. The only collectibles I found various flowers. These are extremely easy to find, as they are very large and practically jump off the page at you. Collectibles are so disappointing. Definitely need a major upgrade. I used to really enjoy this series, but the last 5 or so have been so boring, I haven't purchased them. The stories are slow and predictable, HOPs are the same and there is no challenge. I do not care for choosing my dialog at all. That alone will usually always keep me from buying a game. I want to play, not read! I had to make myself finish the demo. This may be an interesting game to a beginner who has never played any of the others in the series, but to anyone who has, it is way past time to call it a day on this one. I will recommend this only to a beginner, but I'm sure there will be some who find it fun and challenging. I am not not one of them, so no buy for me. As always, try it for yourself and see what you think. We all have different tastes in games and you may find this to be exactly what you are looking for. Thanks for the reviews. Rated 1 out of 5 by cydpaiva from Don't waste your credits. This game was very disappointing. Rated 1 out of 5 by LunaNik from 1½ stars...endless jigsaws and matching pairs This series jumped the shark ages ago, and this 13th episode isn't even about puppets, but dolls. Graphics are inconsistent, music is reused from previous games, voiceovers are awful, the plot is predictable, and gameplay is simplistic and repetitive. The demo include 26 mini-games, of which only 3 presented any challenge. There were 9 jigsaw puzzles, 7 matching pairs, and 3 "copy the clue that's right in front of you." This is not gameplay for adults! Half of the 14 HO scenes in the demo were zoom box mini-scenes. Of the 7 full-sized scenes, only two were challenging: a pictorial list of patterns to find, and a list of items to replace in the scene. The storyline...honestly, I'm really sick of supernatural revenge schemes. This genre is cluttered with them, and they're nearly always silly. Resorting to the supernatural to fill the holes in your plot is just lazy. Overall, this game is a hot mess. The plot is shallow, the production is subpar, and the gameplay is childish. A typical cookie cutter game. Devs can do better than this, as proven by the fact that they have. If they want my hard-earned money, they'll have to earn it. Offering a zillion jigsaw puzzles and matching pairs pasted onto an inane story won't cut it. Rated 1 out of 5 by Boomer47 from Totally Disjointed Story I have played every game in this series. They have ranged from fair to excellent. This is by far the weakest of the series. This game makes no sense. The story has no continuity. The characters drop in and out with no reason for their actions. The mini-games and hidden object scenes are so easy they are a joke. The dialogue is silly and disjointed with little sense to the minimal story line. And the music and voices are annoying. I must have been playing a different games than the 5 star reviewers because this game only rates one star because there are no minus stars. Rated 1 out of 5 by nadaze2da from No, just No! To say I loathed this game is putting it mildly. The Puppet Show games used to be excellent games but the recent ones are real stinkers, including this game. And, there was only the creepy doll for a helper. Where were the puppets? I found myself confused through most of the game about what I should do next. There was no flow, no logic, no fun in this game. It is tedious and boring. I did not find any redeeming qualities in this game. There are rave reviews for this game, but IMO there was nothing to rave about. The creepy doll did little for the game. The mini games were ho-hum, the graphics so so and wasn't there something Leroy could do besides stand around watching you do all the work? As usual, try it out for yourself. But I don't recommend this game. Can you save the young starlet from the wicked doll's curse?